Owen has a passion for trains. 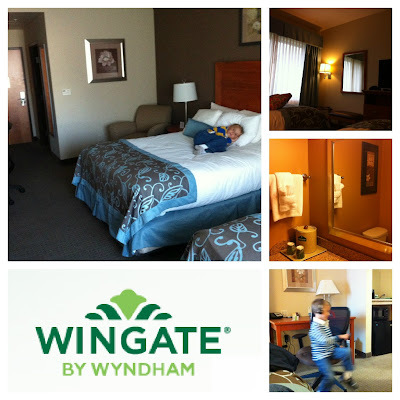 Knowing this, we decided it would be fun to take an overnight trip to Strasburg for his 6th birthday. I went online and started looking up places to stay and things to do besides ride the Strasburg Railroad. Within minutes, I had us booked into hotel, and a list of things to see and do for the two days we were staying. We traveled up on a beautiful fall Saturday. . .the train station looked like a postcard. The boys couldn't wait to get on the train, so we got our tickets and climbed aboard. The ride is just gorgeous. 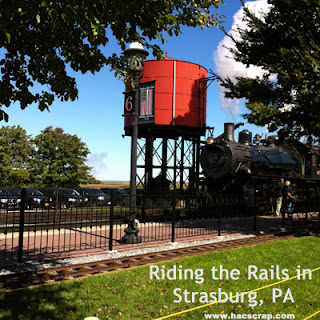 The Strasburg Railroad travels through the Amish countryside, while the conductor tells the passengers a bit about the train, it's history, and railroading in Pennsylvania. My boys never get tired of stopping to hear the "Ghost Train", or hearing about how Abraham Lincoln traveled through Paradise PA on his way to (and from) that fateful event at Ford's Theater. After our train ride, we wandered over to the Pennsylvania Railroad Museum. The shed always takes my breath away, with the number of engines and cars inside. We even got to go out in the train yard and check out the turn-style and trains outside. I booked us a room at the Wingate by Wyndham in Lancaster. I was completely pleased with it's central location to everything, although it was a bit difficult to find (the sign is small). The hotel itself was filled with amenities (iron, ironing board, safe, microwave, refrigerator, hairdryer, etc) and spotless. The decor was very modern and the beds clean and comfortable. We unpacked, rested a bit and grabbed a bite to eat before heading out to Dutch Wonderland. For three weekends in October, Dutch Wonderland does a special Halloween event. They decorate the park, rename the rides with spooky (but NOT scary) names and have a Trick or Treat trail too. We happened to hit the park on the first night it was open, and while it was crowded, we had a great time and got to go on all the rides we wanted to. Including five times on the Roller Coaster. On Sunday, after the great breakfast included with our hotel stay, we headed over to The Choo Choo Barn. If you've never heard of The Choo Choo Barn, it's a 1700 square foot model railroad display. I'm not sure what I expected, but this amazing miniature scene that takes up an entire room was fantastic. I circled the room and the display a good three times. . .I loved when the lights dim and it's "night". My favorite was the house fire. There's this little A-Frame house, and a fire starts. . .the siren blares, and a firetruck leaves the station and heads to the house. Firefighters come out and squirt real water at the house. Amazing. After the Choo Choo Barn, we returned to the Strasburg Railroad, because one ride is never enough for the boys. They have done a great job sprucing up the area around the the train. We rode the Cagney train and the boys rode the push cars several times. We wandered around the shops . . . grabbed a bite to eat in the newly remodeled cafe, and put quarters on the tracks for the train to flatten. After three rides on the train, we called it a day and headed for home. This was our first time staying overnight in Lancaster, but I can promise you it won't be the last. This looks like such a nice day with the family. We live pretty close and I want take the boys! This looks like so much fun. My family and I need to plan a trip soon - I think my kids would love it!